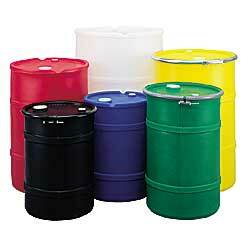 Extremely dependable drums feature .200" wall thickness and straight sides that match those of 55-gal. steel drums. Seamless polyethylene construction is FDA approved. Corrosion-free for outdoor use. FOB NEW JERSEY OR SOUTH CAROLINA. Colors Available: BK - Black, BL - Blue, GN - Green, RD - Red, WH - White, YL - Yellow.